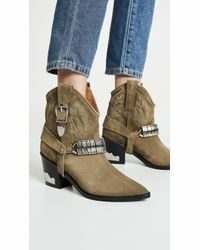 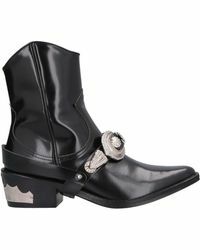 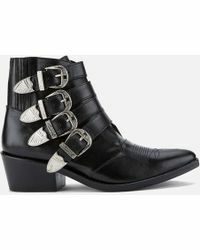 With cowboy influences, the Pulla ankle boot is one of Japanese brand Toga Pulla's most iconic styles. 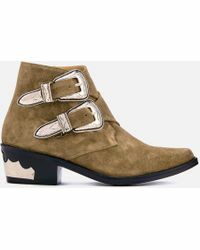 With a pointed toe, buckle strap details and a Cuban heel, the Pulla boot is crafted from the finest leather and comes in a variety of unique colourways. 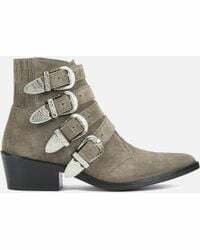 Perfect for all-weather wear, dress the Pulla boot up with floral day dresses or down with distressed denims and a simple white T-shirt. 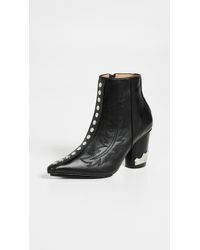 Known for combining contemporary Western and traditional Japanese styles, no Toga Pulla piece quite sums up the brand's style as brilliantly as the Pulla boot.